Elements Applied: Leaves and the herb in general are commonly applied in herbal medicine. History: Basil has gained its popularity for centuries. In France it was a royal plant, in Italy it was linked with love, in India it was used in religious tradition. According to ancient Roman herbalist Pliny, basil is potent of treating gas accumulation in the bowels, and this is generally considered true up to nowadays. Eastern people believed the plant to cure cough and therefore applied it for this purpose, while African inhabitants used it for helminthes. According to early Americans, inhaling the herb could relieve one of severe headaches. Used for: The remedy is used to relieve spasms, stimulate stomach, relieve flatulence, boost appetite and induce excessive milk secretion. 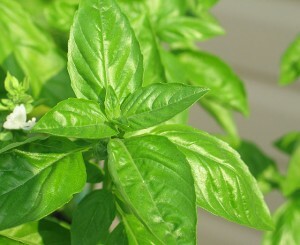 Basil, particularly its leaf, is used as tea for flatulence, dysentery, and sickness. Basil aided with peppercorns and made as tea is conventionally used for feverish conditions. Basil is quite beneficial for the digestive system. It is applied for curing stomachaches, enteritis, constipation, bowel catarrh, vomiting, and gastric catarrh. Additionally it has been applied for severe coughs, relieving spasms. In Ayurvedic medicine basil is applied for fighting bacterial infections, reducing fevers, increasing perspiration, stimulating the nervous system, and relieving spasms. The remedy is widely applied for a set of conditions, like: cancers at primary stages, rheumatism, arthritis, recurrent skin conditions, excessive fat build in the organism (particularly for females of the menopausal period), painful or hard urination, poisoning symptoms, depression, central nervous system conditions, ultraviolet radiation due to direct sunlight exposure, heart weakness and conditions, lung congestion, sinus congestion, nasal congestion, bad memory, colon conditions like flatulence, arthritis, absorption, stomach distention, pulmonary conditions, headaches, fevers, colds, and coughs. Basil includes organic copper, which is essential for iron absorption. Additional Info: The herb grows annually in tropical areas in different parts of the globe. The stems form a shrub which reaches 1-2 feet in height. The leaves are commonly purple-colored. Flowers can have various colors, ranging from red to white, and even purple. They appear in the period of blossoming which lasts the whole summer. Being cut, the herb produces a specific smell. Basil plays a considerable role in Ayurvedic medicine. Indians consider it valuable for air purification, due to its capacity to eliminate harmful agents. The herb is also worshipped in religious tradition due to its alleged ability to purify mind and heart, develop faith and devotion, and protect one who applies it by gods’ protection. Indian people value it as a quite important part of religion. Preparation and Intake: The plant is applied in form of ghee, powder, infusion, and juice. To prepare the herb for use, take one teaspoon of dry herb and infuse it on half a cup of water. Used in a quantity of one or one and a half cups per day, deep gulp at a time. If applied for coughs, aid it with honey. Safety: In the USA the herb is considered generally safe. In the UK the herb is sold with no prescription. In Canada it’s a non-prescribed remedy, as well. In France it’s applied as part of conventional medicine. In Germany it has not yet been permitted for non-prescription use.